George Graham reviews Sting and Shaggy's "44/876"
Over the years there have been a lot of musical collaborations between seemingly disparate performers in numerous genres. Sometimes it’s the result of a record company producer initiating the pairing in the hopes of boosting sales. There have been a lot of those. But there have also been quite a few joint projects which were initiated by the artists who were attracted to each other’s work, even though it outwardly seemed quite different. This week we have another example of the latter, and it’s turns out to be a fun record that has a lot of appeal. 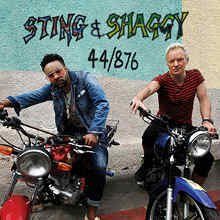 It’s the new album by Sting and Shaggy called 44/876. Sting, of course, is Gordon Sumner, founding member of the band the Police and one of the biggest stars of the music scene. Shaggy is Orville Burrell, a Jamaican-American reggae dancehall style artist and MC, whose career goes back to the early 1990s. Their new project features the instantly recognizable high tenor of Sting with the gruff half-spoken rapid-fire vocals of Shaggy, who had hits with such songs as Boombastic in 1996. Though Shaggy was born in Jamaica and has family there, he spends most of his time in the US, and in the early 1990s, enlisted in the US Marines and is a veteran of the Persian Gulf War. He is said to have developed his style while serving in the Marines. Though he has been recording since 1993, this is his first release in five years. Sting has remained active, with numerous projects and collaborations, with his last album called 57th and 9th released in 2016. Sting lives in New York, and Shaggy has done a lot of his recording there, so that provided the venue for most of the making of the new album. Their collaboration began last summer thanks to Martin Kierszenbaum, who was Shaggy’s A&R man in the 1990s and is now Sting’s manager. Long time fans of the Police, recall the reggae influence of songs like Roxanne and Sting is quoted as saying about Jamaican music “I've always had an affinity for the island, I recognized that it has a magic you just can't explain.” So despite their very different vocals styles, reggae provided a common ground for their joint project. Appearing on the album are musical colleagues who have worked with two individually, including Sting’s long-time guitarist Dominic Miller, plus Sting’s jazz friends including saxophonist Branford Marsalis, and pianist Geoffrey Keezer. Shaggy worked with his long-time producer and multi-instrumentalist Shaun Pizzonia, who somewhat confusingly goes by the name Sting International. He sometimes plays bass on the album, so the credits for some tracks say Sting and Sting International on bass. All the tracks are collaborations among Sting and Shaggy, with some additional co-composers, including from both Sting’s circle and Shaggy’s. Gordon Sumner and Orville Burrell, better known and Sting and Shaggy, on their new joint album 44/876 have a created an unexpected but surprisingly compatible blend. Sting’s influence by reggae going back to his early days with the Police, has been an undercurrent to some of his music over the years. The contrast between his airy vocals and Shaggy’s dancehall style recitations, make for an intriguing but ultimately satisfying and entertaining juxtaposition. The music is also a dichotomy between Sting’s somewhat jazzy style and the dance-oriented reggae of Shaggy. This is an album that is likely to reach fairly wide audiences, on the basis of the performers’ respective reputations, and in a way it’s made as a pop album, with a dozen songs, only one of which is over four minutes. The musicianship is first rate, and the production tasteful. While there are some contemporary pop elements like looped rhythms, the record is blessedly free of those banes of commercial music, fake handclaps and Auto-tune pitch distorted vocals. Our grade for sound quality is an A-minus. The mix is done well, with good clarity and freedom from dumb studio effects. The dynamic range is about what could be expected from a pop album, with loudness-jacking volume compression making it not an audiophile recordings. Musical collaborations between dissimilar artists have been happening for decades, and some have been little more than novelties. But Sting and Shaggy, despite their very different musical approach and backgrounds, hit it off very well and have made a satisfying, entertaining album.